Home � Disney World News , Downtown Disney , New At Disney World , Raglan Road , St Patrick's Day � Mighty St. Patrick's Festival At Downtown Disney! 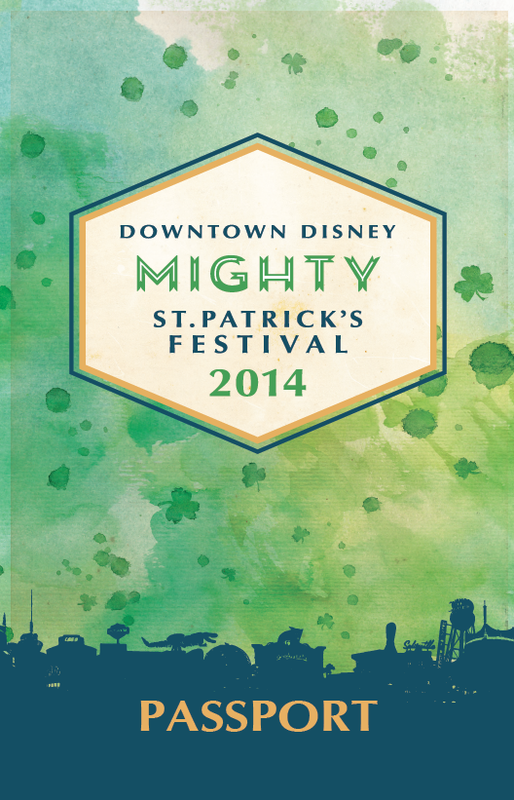 Mighty St. Patrick's Festival At Downtown Disney! This year you can enjoy St. Patrick's Day like never before at the Walt Disney World Resort! Forget about containing your Irish Side to just one day, Disney has now extended the celebration of all things Irish to 11 magical days at Downtown Disney! Elevation – Rock out to the vibrant sights, memorable sounds and unforgettable songs of U2, courtesy of one of the world’s most popular U2 tribute bands—March 15 and 17, 2014. The Willis Clan – Enjoy a unique blend of old and new as this Tennessee family of performers merges their Irish roots with other popular music and dance genres—March 7 - 9 and 13 - 17, 2014. We Banjo 3 – Soak up the spirit of an award-winning quartet that combines Irish sounds with old-time American and Bluegrass tunes—March 7 - 9 and March 15 - 17, 2014. Goitse – Treat your senses to the talents of this 5-piece band making a fast name for themselves among connoisseurs of old-fashioned Irish melodies—March 11 - 17, 2014. 3 Dollar Band – Discover a unique blend of folk songs inspired by Irish and Appalachian influences, with just a dash of French and Bulgarian rhythm—March 14 - 17, 2014. Nova Celtic – Experience Irish music from an all-new perspective as Nova Celtic puts their own twist on a collection of popular songs—March 7 - 17, 2014. Creel – Lock your arms for sets from Raglan Road’s resident house band, with their near-endless repertoire of reels, songs, ballets and more—March 7 - 17, 2014. The Brayzen Heads – Sing along with this duo during energetic performances as they put their own spin on traditional Irish and modern music—March 7 - 17, 2014. The Raglan Rebels – Prepare to be blown away by the energy, excitement and incredible abilities of a popular Raglan Road house band—March 7 - 17, 2014. West Coast Trio – Hear the authentic vocal stylings of a trio hailing from Ireland’s West Coast, as accompanied by accordions, flutes and whistles—March 7 - 17, 2014. Raglan Road Dancers – From March 7 to March 17, 2014, catch this award-winning dance troupe roaming about the Downtown Disney area in search of all-new audiences. Keep your eyes peeled for one of their 15-minute pop-up performances! Irish Dance Workshops – Don’t just sit there—from March 15 to March 17, 2014, step right up and put your feet to work during enchanting dance workshops, as taught by Ronan McCormack and the Raglan Road Dancers at Raglan Road! Raglan Road Irish Pub and Restaurant – Mosey up to one of 4 bars where you can indulge in Irish, European and American beers and tour a menu of modern cuisine from Master Chef Kevin Dundon. Paradiso 37 – Take a trip to the end of the rainbow where you can try out popular treats and Irish cocktails, like the large-and-in-charge specialty beverage known as The Giant Leprechaun. Planet Hollywood – Add some glitz and glamour to St. Patrick’s Day at Planet Hollywood, where you can find food options like Irish egg rolls and festive libations including The Crazy Leprechaun, Planet Shamrock Jell-O Shots and the non-alcoholic Young Lad Irish Sour Apple. Bongos – Move to the beat of a different drum with seasonal items from this favorite Cuban café, with Havana-inspired offerings you won’t find elsewhere such as the Cuban Leprechaun Mojito. T-Rex – Travel back in time for a prehistoric celebration of all things Gaelic, with featured food items and specialty beverages like the Candy Apple Cotton-Tini. Portobello – Relish in Italian flavors at Portobello where you can enjoy a Fiddler’s Dream—mixed with Jameson honey simple syrup, Fever Tree ginger beer and a splash of lemonade. Fulton’s Crab House – Sail into this seaside port to discover a St. Patrick’s Day specialty drink known as Limey Leprechaun, which includes Cuervo Gold, Midori, pineapple juice, sour mix and ice. Wolfgang Puck Café – Waltz by Wolfgang Puck Café where the staff is kicking off the festivities with Shamrock Martinis, mixed with Midori, green crème de mint, ice cream and a chocolate swirl! Forty Thirst Street – For a quick pick-me-up with just a hint a fun, drop inside this popular stop where you can fill up your mug with delicious Irish Cream Coffee. There will be special St. Patrick's Day and Irish themed merchandise available jsut for this event all throughout Downtown Disney. It's not easy being green...unless you're at the Mighty St. Patrick's Festival. Get ready for a St. Patrick’s Day celebration the whole family can enjoy! 0 comments to "Mighty St. Patrick's Festival At Downtown Disney!"